Denzle Bell Venable, born Jun 26 1905; died Oct 1994; married Guy Marl Millikan (daughter: June Millikan, married Gene Cordell [email: ]). Venerable, Lemuel, head-of-household, age 23, born June 1876 in Indiana; father born in Virginia; mother born in Indiana; married 4 years; occupation: farmer; rented farm. Venerable, Florence, wife, age 21, born Oct 1878 in Indiana; parents born in Indiana; married 4 years; no children. Vennable, Lem, head-of-household, age 33, born in Indiana; father born in Virginia; mother born in Indiana; first marriage, married 15 years; occupation: laborer, on farm; owned home (mortgaged). Vennable, Florence, wife, age 31, born in Indiana; parents born in Indiana; first marriage, married 15 years; 1 child, 1 living. Vennable, Denzel, daughter, age 4, born in Indiana; parents born in Indiana. Veniable, Lemuel, head-of-household, age 43, born in Indiana; father born in Virginia; mother born in Indiana; rented home; occupation: farmer, general farm. Veniable, Florence, wife, age 41, born in Indiana; parents born in Indiana. Veniable, Denzle, daughter, age 14, born in Indiana; parents born in Indiana; attended school. Hinshaw, Belle, mother-in-law, age 61, born in Indiana; parents born in Indiana; widow. Venerable, Lemuel, head-of-household, age 45, born in Indiana; parents born in Indiana; first married at age 21; rented home; radio in home; occupation: farmer, farm; not a veteran. Venerable, Florence, wife, age 43, born in Indiana; parents born in Indiana; first married at age 19. Florence E. Venable, 93, Hortonville (R.3, Sheridan), died suddenly Saturday at her home. The deceased was the daughter of Mr. and Mrs. Andrew Hinshaw and was a member of the Hortonville Friends Church. 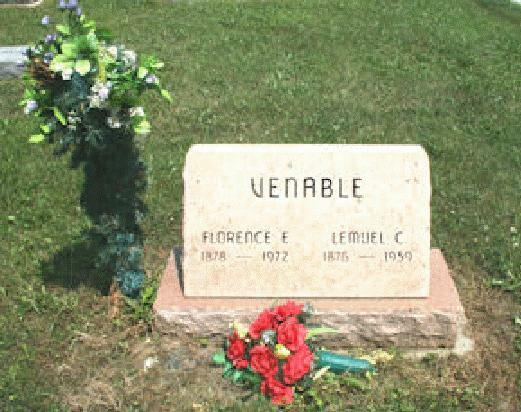 Her husband, Lemuel Venable, died in 1959. Contribution from Don Cordell (). 1880 census, Washington Township, Hamilton County, Indiana; roll T9-0281, ED 38, page 397B, line #30, dwelling #266, family #284. 1900 census, Washington Township, Hamilton County, Indiana; roll T623-375, ED 92, page 7A, line #18, dwelling #152, family #157. 1910 census, Washington Township, Hamilton County, Indiana; roll T624-353, ED 111, page 249A, line #2, dwelling #26, family #24. 1920 census, Washington Township, Hamilton County, Indiana; roll T625-435, ED 110, page 5B, line #69, dwelling #139, family #139. Indiana Marriages, 1845-1920; http://www.ancestry.com (Book 9, page 438). http://www.ancestry.com GEDCOM file H11260a.GED (from ). Contribution from Gene & June (Millikan) Cordell (). Death notice for Andrew Hinshaw. 1930 census, Adams Township, Hamilton County, Indiana; roll T626-590, ED 3, page 2A-B, line #50, dwelling #45, family #45.